We have all experience an “aha!” moment, but how often is that moment at work? People with “creative” jobs talk all the time about the struggle to create on a deadline or within parameters (I’m currently procrastinating on another writing assignment by working on this blog post). Jonah Lehrer explores this idea of working creativity and more in his new book, Imagine: How Creativity Works. The book explores where innovative thoughts originate and explains how some companies are now working to create environments where they’re more likely to occur. Scientists have determined that people in a relaxed state and a good mood are far more likely to develop innovative or creative thoughts. And companies are now taking advantage of this fact. Lehrer points to 3M, which started out making packaging tape and has now expanded into other sectors including electronics and pharmaceutical delivery. Companies like 3M and Google encourage their employees to take time to be creative and work on other side projects. What else works? Read the rest of the article on NPR, and the book. great post, succint summary and description. love lehrer’s stuff, and ‘fresh air’ is one of my favorite forums. rock on! 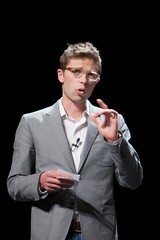 great piece on author/writer jonah lehrer, and his new book on creativity. Obviously when we are in positive state we can generate more ideas but sometimes stress pushes us to think faster and to take decisions. I personally can not be creative if I am having some stress. I am doing everything in some “drama queen” mode.